Available for a variety of Polaris RZR platforms, this strong yet lightweight UTV roof is high in quality. Made of 1/8″ aluminum, the Outlaw roof features an integrated visor and a formed side gutter to prevent dripping into the cab, giving your passenger and you maximum protection from rain and other elements. It also features a factory installed cushioning gasket for a snug fit to help reduce rattling as well as all the necessary hardware for the install. Furthermore, it’s designed to work with your RZR’s factory visor. Axiom makes their roof in a one piece design for two seater RZRs and a two piece design for the 4 seat RZRs. The two piece tops features a leak proof seam to prevent any water from entering the cab. The Outlaw roof is available in a variety of powder coated colors to match your machine as well as in raw aluminum for those custom painted applications. Click here to purchase the Aluminum Outlaw UTV Top for 2 seat Polaris RZR applications. Click here to purchase the Aluminum Outlaw UTV Top for 4 seat Polaris RZR applications. 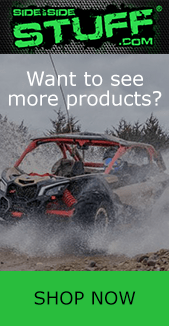 Browse our complete selection of Axiom Side By Side UTV products.